MATT TUBBS believes Pompey’s stability is breeding success. And the striker reckons Andy Awford’s settled formula is helping the Blues build attacking impetus. Tubbs highlighted the growing understanding with Ryan Taylor and Jed Wallace as a key factor in Saturday’s 6-2 demolition of Cambridge United. Now the challenge is make it 14 points from 18 against Tranmere at Fratton Park tonight. Awford has played the same starting XI in the past four games. Tubbs has no doubts that has been a big factor in his team’s upturn in results. He said: ‘There’s potential there but we can’t get too excited. ‘We can’t let that thought overshadow our performances. ‘We’re looking forward and we’re looking forward to picking up points. ‘The form is brilliant. If you can get a run together like we have, you can afford to lose one – if you pick up again. ‘Since I’ve been here there’s been one game where we haven’t played well. ‘We’ve played some good football as a collective. ‘We’ve kept a solid base and, if you kept a solid base in any division, you stand a good chance of doing well. ‘Stability is brilliant because we get partnerships all through the team. ‘There’s myself and Ryan and the three centre-backs, who have an understanding with the wing-backs. ‘You get to know each other’s games week-in, week-out. That’s what has happened in the past four games. ‘We’ve had a settled side with the same system and it’s worked for us. ‘We have had four clean sheets and a settled team before Saturday. Tubbs took his tally to the season to 19 goals with his hat-trick against Cambridge. It’s four in the last four in Pompey colours, too, since he made his arrival from Bournemouth after a loan stay at AFC Wimbledon this season. Jed Wallace grabbed his 14th goal of the campaign in the romp at the Abbey Stadium – and played a part in four other goals. 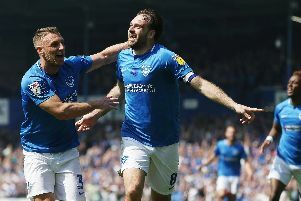 Tubbs hailed his quality and believes Pompey are now beginning to carve out the chances needed to progress – but there’s still room for improvement. Tubbs said: ‘In the games we’ve played together it’s worked well. ‘With Jed as well we’re setting each other up quite well. Jed is the type of player I love playing with. ‘You know when he is playing he is capable of doing things. ‘There are the wing-backs who are full-backs by trade, but they are modern full-backs who are almost like wingers. ‘They have a good energy and we’ve been working on our shape a lot. ‘As long as they can keep creating the chances, whoever is up there can take them. ‘I think we’re getting into positions to create chances. ‘I think our final-third play could be a bit better, though. ‘But we’re a new side with a new system.